Clear roof and gutters of debris. Some stray debris on your roof and gutters can be easily ignited by embers that are blown by the wind. To avoid fire from sparking on top of your property, make sure to regularly clean your roof and your gutters. You can also us covers for your gutters to avoid debris from getting in them. Consider using non-combustible materials for your property. If your property is in close to an area with a lot of vegetation, you might wanna consider using non-flammable materials such a gravel, concrete or brick for your walls, fences or decks. Use Class A fire-rated roof covering. Another thing that you should consider when having your property constructed is to use roof materials that are fire-rated, since these materials are inherently safer. Cover your eaves and vents with mesh. In case wildfire occurs within your vicinity, it’s vital to make sure that the fire stays out of your house. Another way to prepare for this disaster is by covering your vents and eaves. It’s also a good idea to use smart HVAC systems that will help you monitor the quality of air indoor so that you will know when or if it reaches a hazardous level. Protect your windows. If you use weak window materials, a slight exposure from heat can easily cause your window to crack. It’s wise to prepare for fire by using multi-pane tempered glass windows. If a fire occurs, make sure that you close your windows. In cases like this, prevention is always better than cure. It’s best to prepare yourself and your property, especially if you are located in an area that has high occurences of wildfires. 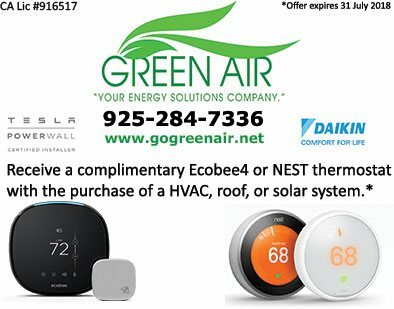 If you are looking for experts who can provide you with professional HVAC repair and installation services, contact Green Air Heating and Air Conditioning. Give us a call at (925) 62-SOLAR or fill out our contact form. We serve residents of California, including Concord, CA.